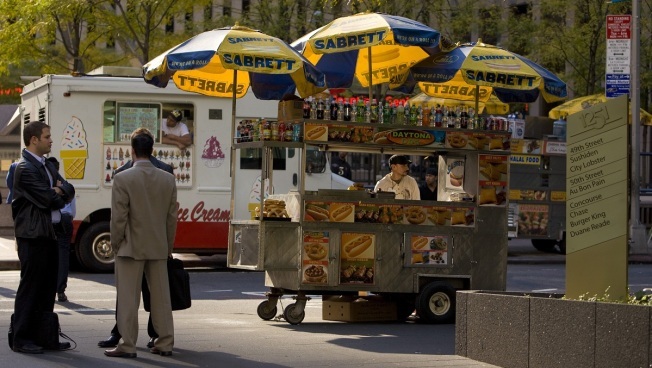 The City Council on Thursday approved an ordinance that would allow food cart vendors to obtain licenses after being banned for decades. The ordinance allowing the city's estimated 2,000 food cart vendors to get licenses was first approved by a City Council committee last week. Food cart advocates say the move will create as many as 6,400 new jobs and up to $8.5 million in new local sales-tax revenue. Chicago currently prohibits street vendors from selling anything more than frozen desserts and uncut fruits and vegetables. Cooked food such as tacos and hot dogs and cut fruits and vegetables are forbidden. Despite the ban, vendors risk arrest by serving an estimated 50,000 meals daily. "They are always hiding from the police, looking around," said Vicky Lugo, vice president of the Street Vendors Association. "They're not criminals. They're not doing anything but working. They are just providing for their families." Alderman Roberto Maldonado, who says he buys tamales from a cart vendor every Sunday, proposed the ordinance. He projected the licenses would bring in $2 million to $8 million per year for the city. "At a time when the national debate has turned towards demeaning our immigrant population, we must strengthen our laws to bring our immigrants and entrepreneurs out of the shadows and give them the respect and legitimacy they deserve," Maldonado said. Mayor Rahm Emanuel's administration supports the ordinance. Advocates said pushcart food vendors should have been legalized three years ago when the council authorized food trucks that prepare their items on site.